I had great intentions to post about our Spring Break trip to Mexico as soon as we got back, but life happens and the blog post didn’t! Luckily, the trip was so incredible I can still vividly remember all the things that made it wonderful. 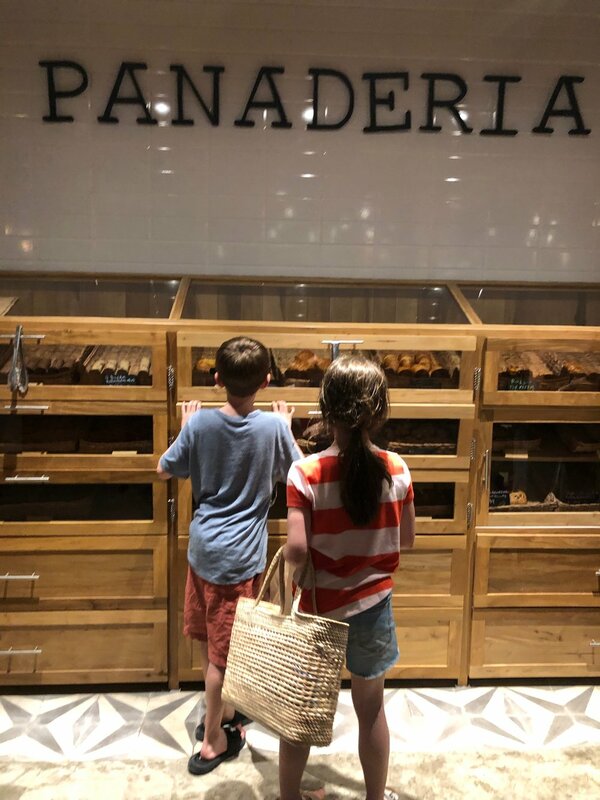 So for those of you that asked, here is a play-by-play of our vacation and all the things we would do again (hint: everything!). We knew we wanted to go someplace warm. In mid-March, there aren’t too many places in the United States beyond South Florida to choose from that would have guaranteed sundress weather. Mexico became an easy choice. First, logistics. Since we have a companion pass on Southwest, we fly with them whenever possible. Southwest has flights from Nashville to Cancun every day of the week, but only on Saturdays do they offer a nonstop flight. With that in mind, we decided to take a seven-day trip to Mexico, leaving on a Saturday and returning on a Saturday so that we could fly direct. We knew we wanted to spend part of the time having ‘adventures’ and the other part relaxing. So we opted for the first part of our trip to be more out-of-the-box and the second part to be at a more traditional resort. 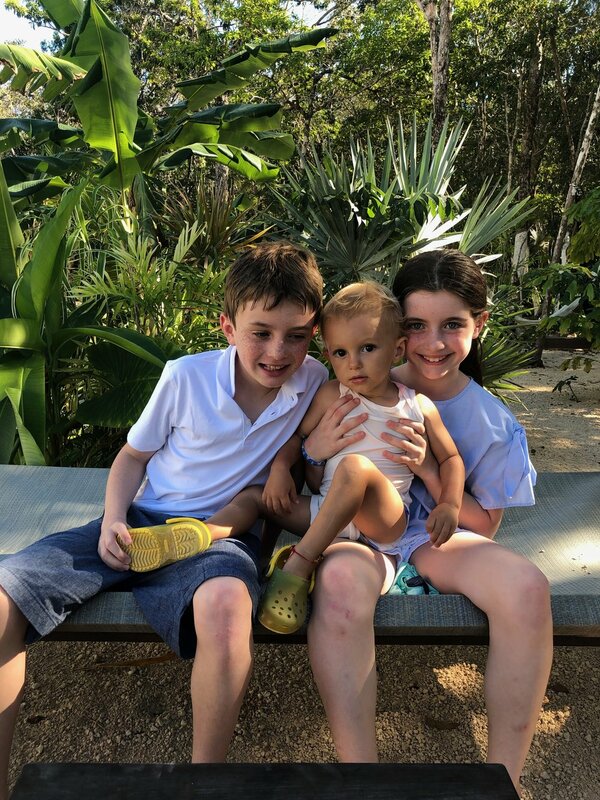 Tulum seemed to be just the right amount of rugged for where we are in our lives – and also felt safe enough for us to travel to with a 9 and 11 year old who had only been out of the country once before. We had stayed at a small, 60-room resort in Maroma the previous year, and decided to return to that property for a second time. Deciding on the first part of the trip was the hard part. Long ago, I fell in love with an AirBnB property I found on Instagram, called Kima Tulum. When I booked with them, they were a relatively new property with only a few reviews, but all of the reviews were very positive. We decided to take chance on it, and are so happy we did. Kima Tulum is run by a French couple, Dorothee and Enzo, who live there full-time with their almost 2 year old son, Leo and their young German Shepherd, Gaia. Dorothee handles most of the communication from the moment you book your rooms to the moment you arrive. She always gets back to you quickly, gives wonderful recommendations for food or activities, and was incredibly easy to deal with. All you need to do is a take a look at their instagram or the photos and reviews on AirBnB to see what a special place their home is. Dorothee and Enzo built it from scratch in the middle of the jungle and everything is eco-conscious– from the construction materials to the landscaping to the products they use (and sell, if you are interested!). There are 3 rooms available to rent. The rentable rooms are attached to the main house, via an ‘L-wing’ that is perpendicular to the main house and parallel to the pool. If this leads you to question whether or not you’ll have any privacy, don’t! You can have as much or as little as you want. The pool is a ‘shared space’ much like you’d have at a hotel, while the rooms- spacious and spotless- are a cozy home away from home. Because we traveled with our two kids we opted to get two rooms (king beds are the only option at Kima). There is no way of connecting the rooms at Kim, so we split up- my husband slept with one child and I slept with the other. This was no problem at all, for us. It was wonderful to have the pool right outside the front door because we were able to do our own thing in the rooms (like read, review pictures, etcetera) while the kids were right outside the door swimming. One thing I would note: if you are not ‘dog people’ you should reach out to Dorothee before booking. Gaia is a young, sweet, enthusiastic German Shepherd with a loud bark and a ton of energy (i.e., she still jumps up on people)- so if this concerns you at all, you should reach out to see what stage she is in her development. Our entire family loves dogs and are used to their energy, so we did not have a problem with it, but I can think of a few friends who might! By the time you consider booking there, she might be grown up enough to not be a concern to anyone. A couple of other things I would note: 1) Kima Tulum is not near the beach. You will have to drive or take a Lyft/Uber to get around. We knew this going in and it didn’t bother us, particularly since we were going to be a at the beach for the second half. 2) the house is a little remote and the road getting to it is very bumpy and not paved. I think it would be hard to get around without your own car. 3) did I mention you will need your own car? I just want to reiterate that I would not book Kima unless you had your own car. Fortunately, we did have a rental car. We (i.e., me) had a lot of anxiety about it prior to the trip for a couple of reasons. First of all, we had been in an accident in Costa Rica 13 years prior, so any travel abroad is a little intimidating for us. Secondly, we had never driven in Mexico nor known anyone from the States who had rented their own car (everyone told us to get a driver). We reluctantly decided to rent one, but ultimately were so glad we did and never once had an issue as far as safety or navigation goes. My husband was given this ‘assignment’ as his one big task of the trip, and he spent hours finding the best option for a car rental. So let me save you the trouble! Here’s the deal: the traditional carriers with names you are used to (like Hertz, for example) are actually not run very well and are considered corrupt by some people (this is all according to research and reviews). The name that kept coming up was ‘EasyWay’ car rental. It is a local company and doesn’t have much of an online presence. But our experience was good. We were picked up at the airport and driven in a van to their shop offsite, about a mile away. The car was just as described, clean and functional. They are only required to give you a partial tank of gas, so just know that you will want to make a stop at the gas station early in your travels. They inspect the car prior to rental, so use that time to point out any scratches or dings you don’t want to be held accountable for. From there, everything was easy. The cost for the full week was $380. When we returned the car, we didn’t have any issues. They had an employee waiting for us, who drove us and our luggage in the rental car, and dropped us off at the front terminal with plenty of time before our departure. It was so easy and convenient, I can’t say enough good things about that experience, given how much I had secretly dreaded it. On to the more fun stuff! Adventures in Tulum. We had been to the Quintana Roo area the year prior, and knew that any experiences we booked should be done through Living Dreams. Living Dreams, we learned, was founded by a group of native Mexicans who had done tours for larger outfitters, but wanted to offer something more personal for their clients. We knew from our previous trip that they were professional, easy to communicate with, and kind, so there was no question that we would use them again. If you want to learn more about them, you can visit their website here or read Trip Advisor reviews here. I think they have almost all 5 stars—-and no, this is not an ad or paid for in any way. We just loved them. They will also come to your location and pick you up in a new, spotless white van. Given our remote location and our desire to drive ourselves as infrequently as possible, this was a big plus. The first adventure we signed up for was the Snorkeling with Sea Turtles. Our guide, Asuszannah, picked us up promptly at 9. She drove us straight to the beach, where a boat was waiting for us. We were fitted with snorkel gear and life vests and then were on our way. We had a brief ride out into the ocean and were guided to some areas where the sea turtles typically resided. We were told that we could see zero sea turtles or we could see many— since this was not a ‘zoo’ it was their best guess possible as to where the turtles would be that day. Fortunately, we did get to see three turtles during that portion. Unfortunately, my GoPro froze up for most of it (but that’s another story!). After we had seen enough, we were taken back to shore where we dried off. From there we headed to a Mayan reservation where we did cliff jumping, cenote (underground limestone caves) swimming, canoeing and zip lining. While the sea turtle portion was fun, we definitely enjoyed this part of the day more. We never felt unsafe at any time, and all the safety precautions were taken seriously. There was hardly anyone else there, so it felt like we had the whole place to ourselves, which made the experience even more enjoyable. Everyone in the family took turns jumping off of cliffs, zip lining to the center of the cenotes and jumping, swimming in one of the more closed cenotes (where there were bats!) and much more. If you have an adventurous family, this was a fantastic experience. We concluded that adventure with a delicious lunch at the Mayan plantation. Again, we were the only ones eating there. It was as if a humongous feast had been created just for us. The Mayan women made fresh tortillas underneath an exposed thatch hut while we dined on chicken that had been cooked underground, rice served in clay pots and drank delicious hibiscus tea. The day concluded with our kids picking out a bracelet that had been woven by some local Mayan children. I think the adventure for the four of us cost around $650. Given that it was a private tour and included everything (transportation, meals, boat rides, zip lining, etcetera- even the bracelets the kids picked out! ), we felt that it was very reasonable. Our kids and I get very motion sick, so driving around in a big tour bus was not going to be a great option for our family, nor nearly as enjoyable. We did not regret that money spent. Which was a good thing because we used Living Dreams the following day! That evening we went to Hartwood in the beach area of Tulum for dinner. We had been told by just about everyone how amazing Hartwood was for a nice meal out. The catch is, you are supposed to make reservations by emailing them exactly a month in advance, to the day. I tried this method of communication, but never got a reservation (or response, for that matter!). Nevertheless, we were undeterred and attempted to get in by showing up at 4:45 (they open at 5). We were the 9-12th people in line, and lo and behold, we were able to get in! The meal was exceptional, and truly a unique experience. While I was so glad we were able to go, we were not prepared for the price tag (around $300!) or the fact that we would need to pay in all cash. We barely had enough to make it out of there without washing dishes, but fortunately were able to do it by paying partial in American dollars. I would recommend bringing lots of pesos if you decide to go, because the exchange rate that gave us for that portion was not good. Nonetheless, we chalked it up to part of the adventure and ended the evening with gelato with our remaining handful of dollars. The next day we had signed up for another adventure with Living Dreams, but before I forget, I should mention the breakfasts at Kima Tulum. While they don’t advertise that they are a bed and breakfast, that is basically what they are. Enzo creates amazing carved fruit plates, and often serves delicious yogurts or croissants from the local bakery in addition. I was grateful that we didn’t have to go off searching for food first thing in the morning. It enabled us to have a lazy start to our day, which is exactly what you want on vacation! 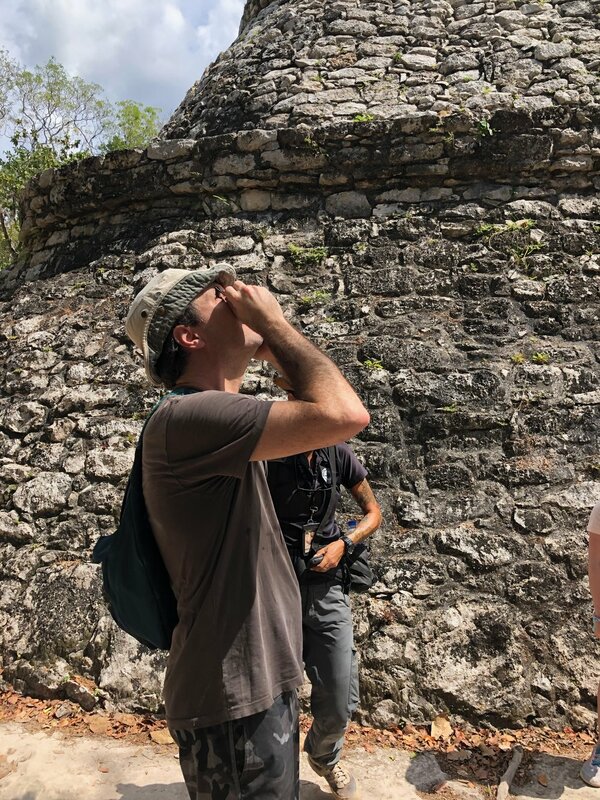 Our adventure for this day was to the Coba Mayan Ruins and to a nearby Mayan reservation that had spider monkeys and some other unique features. So we started the day in Coba, a town about an hour or so away by van. Our tour guide, Angela, was incredibly knowledgeable and had a passion for Mexican history and archaeology. While I can’t say that we are the biggest archaelogy/history buffs, she did a good job of making this portion of the trip enjoyable. She made it engaging for the kids, and also respected that it was time to move on when we had enough of the Ruins. We were able to climb to the top of an ancient pyramid (I would recommend shorts, tennis shoes and bravery!) and get some perspective on what it would have been like to be a Mayan in ancient times. When we were done at Coba, we ate lunch and then got back in the van for a 30 minute ride to the next location. There, we were greeted by a Mayan jungle guide who took us scouting for monkeys. We did more zip lining and canoeing to a more remote part of the jungle. There, we found groups of spider and howler monkeys. They were fairly high up in the trees, but clearly visible and fun to observe. We ended this adventure in a unique way– in a closed underground cenote that used to be a burial ground a thousand years ago. Because the Mayans consider it sacred, we had to go through a ceremony with a Shaman before being allowed to enter. The experience was equal parts spooky and cool. We had to be lowered into the cave by a rope, and once inside, it was just us, the tour guide, lots of bats and the skeletons that were below us. Freaky! But since our kids wanted to do it, we put on our brave face as well. In retrospect, I’m really glad I did it– I would have hated to miss out on that unique experience. Once that was over, we piled back in the van and took a sleepy ride back to Kima. 1- Gypsea Market. This is like an extra beautiful Whole Foods. Gypsea was on the main strip right down the road from Kima Tulum and had great snacks and in-between meals for everyone. 2- A little behind Gypsea Market, on the small road adjacent to the main road, is Deer Tulum. This is a recently opened home store that has lots of unique, Mexican-made products. I could have bought several items, but with limited suitcase space, I was able to resist. 3- Casa Pueblo- this is both a boutique hotel and a restaurant further down from Kima on the main strip. We ate there twice and had good meals both times. It’s a beautiful space full of beautiful people and great people watching. We loved that the kids could roam while we were seated. They dipped their feet in the pool, played with the hotel dogs and walked around all within a contained, safe environment. 4- Encanto Cantina- this is low-key restaurant not far from Kima Tulum. We ate there our first night, and went back for drinks another time. It is also on the main strip and easy to get to. 5- Hartwood - worth mentioning again. If you want to go, do your best to make reservations exactly a month in advance or plan on getting their early (4:45 p.m.) for a chance as a walk-in. There were so many other places we wanted to try. Our only time near the beach portion of Tulum was during our night out at Hartwood. If you want to go to a beach club there or have more time close to the water, Dorothee will send you her ‘Tulum tips’ .pdf with all her best recommendations. There were several things on her list we didn’t get to, but that is one of the limitations of traveling with kids! From there we headed to our resort in Maroma, called the Belmond Maroma. It was the perfect way to spend the second half of our trip– snorkeling every day (so much sea life to be seen! ), swimming, relaxing, biking, and lots and lots of eating. The hotel can help provide you with as much or as little as you want to do. We love the small size of the hotel. We first discovered Belmond Maroma through a travel agent – Neel Young of Belle Meade Travel – so if you are looking for resorts to visit and want the ease of someone else planning, I would highly recommend her! While she did not book this particular trip, she had booked the prior trip to Belmond, and was able to help us easily compare prices, rooms, and act as our advocate for any portion of the trip, if needed. We have had some negative travel experiences in the past, and honestly, were concerned how this trip would go, but we were all so pleased with how everything played out. It might even be our favorite all-time trip to date. I certainly wouldn’t hesitate to recommend our entire itinerary to anyone visiting the area. Several people ‘warned’ me about Mexico and passed along horror stories (always so helpful, right?! ), that I had some serious reservations about traveling back there with my kids, but I am so, so glad I did. I would go back there in a heartbeat - either on a couples trip or with kids again. Lastly, if you are a nervous Nelly traveler like me, I would recommend buying a medical travel insurance policy. Ever since our bus accident in Costa Rica, I’ve made a point of buying medical travel insurance anytime we leave the country. I am always happy to not have to use it, but it gives me a peace of mind I know I wouldn’t otherwise have. There are several companies out there that offer this sort of thing, but Medjet Assist is the one that was recommended to us time and time again. The policy we purchased for our entire family for the seven day trip was around $180. The one place I really wish we had gotten to while in that area, but didn’t, is Coqui Coqui. It just was not in the cards with two kids in tow, but if you are traveling without littles, make sure to put it on your agenda! I am always happy to answer questions if there’s anything I didn’t cover here! Wishing you fun and safe travels! For video snapshots of our trip, check the ‘travel’ section of my stories on instagram. 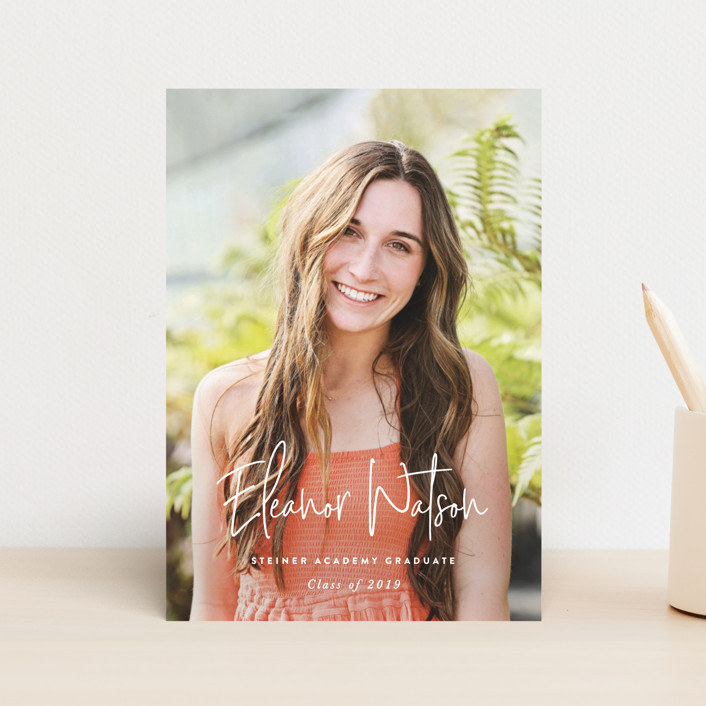 Some of my newest graduation announcements have launched on Minted. I researched camera backpack options for a long time. This one kept coming up as a favorite, and all of its handy pockets and easy access to camera and accessories (while not looking like a camera bag), made this one a winner. Best price here. Next up, kids water shoes! I think their official category name is ‘kids active sandals.’ We tried everything– Keens, Chacos, Under Armour, Sanouk, etcetera, but ultimately, the winner was a Nike water sock. These fit our kids’ narrow feet without giving them the heeby-jeebys (one of them has some sensory issues and doesn’t like the feel of water shoes). While these sensory-sensitive children are particular about their feet, they are also very particular about sunscreen. Of course, the one they have ‘approved’ is not cheap, but it does tick all the boxes that are important to me (reef-safe, organic, non-toxic, and a good SPF). Coola is the absolute winner for us (just make sure not to get the matte-tinted Cucumber one which will stain bathing suits). I’m still working on some other vacation purchases and would love to know if there is something that will save me on our trip! I try to stay away from bread most of the year, but I can’t resist making my mom’s dill bread recipe in the winter. I just made it for the first time with my new Emile Henry loaf baker, and it turned out even better than usual! We are down to crumbs, and I will be sticking a new loaf in the oven soon. Here is the recipe, in case you want to try it yourself. Baker linked here. Mix 1/4 cup of flour, sugar, instant minced onion, dill seed, salt, baking soda and undissolved yeast. Add softened butter. Gradually add water; beat 2 minutes at medium speed of electric mixer. Add cottage cheese, egg, 1/2 cup of flour or enough flour to make a thick batter. Beat at high speed for 2 minutes. Stir in enough additional flour to make a soft dough. Knead a little; transfer to a greased bowl. Cover; let rise in a warm place, free from draft, until double in bulk, about an hour and 15 minutes. Stir batter down. Turn into a greased 1 1/2 quart casserole. Cover; let rise in a warm place until doubled, about 50 minutes. Bake at 350 about 30 minutes or until done. Remove from casserole. Cutter top. Cool on wire rack.